Dentures are the traditional means of restoring the gaps in your dentition that result from tooth loss. Dentures come in many forms – they can be full or complete dentures if all teeth are lost, or partial if only some teeth are lost. 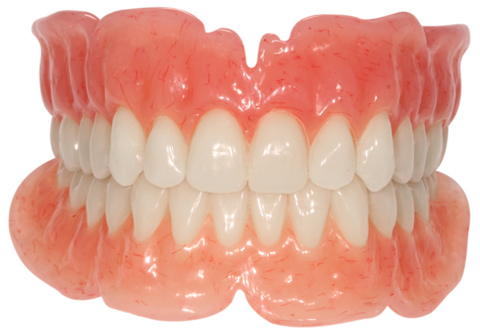 Dentures are made from a variety of materials including acrylic and chrome. Dentures are a removable solution. 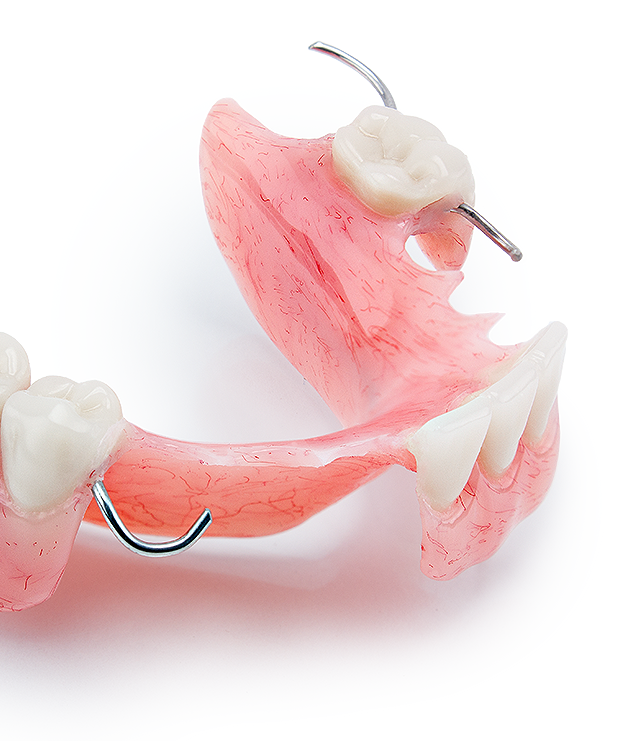 Full or partial acrylic dentures can be used to replace missing teeth in the upper or lower arch. Acrylic dentures generally use suction from the soft tissues in your mouth or small undercuts around or between the teeth for retention. Your facial musculature can also help to retain a well made denture. While full or partial acrylic dentures function well and look good, they can take a little time to adapt to and are removable which some patients do not like. In addition, they can require some palatal coverage which can alter taste sensations and again take some time to adapt to. 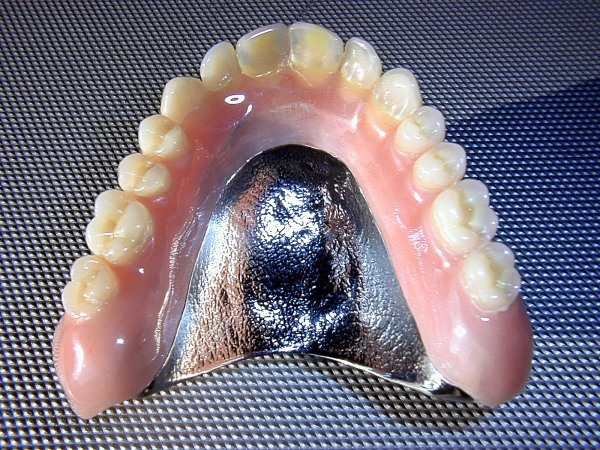 Partial chrome dentures can be used to restore the spaces left following tooth extraction and healing. These dentures are very precisely fitting and their construction uses clasps and rests which help to anchor them to the remaining teeth in the mouth which allows more stability in function. In some cases, the remaining teeth may be slightly prepared to receive and retain these dentures, and in some cases remaining teeth will be crowned to provide specific rest for the denture and parallelled guide plains to ensure the denture is as accurately fitting and as retentive as possible. 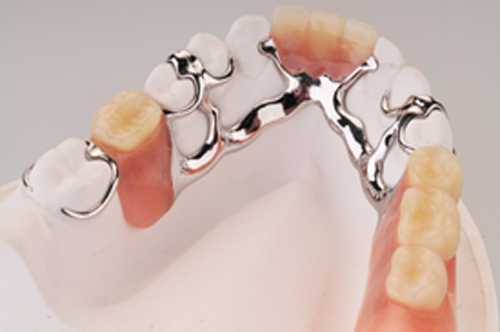 While some of the clasps used are metal, aesthetic acetyl clasps are used if required towards the front of the mouth. With respect to acrylic dentures, chrome dentures are finer and more precisely fitting, with less requirement for palatal coverage. The chrome dentures are, however still removable. An example of a partial acrylic denture with clasps. Immediate full or partial dentures are used as an intermediate treatment for patients who require tooth extractions. These dentures are carefully made for patients who require teeth to be extracted and are fitted immediately after the extractions allowing patients to maintain the aesthetic look of the mouth at all times. These dentures fit well but are not as accurate as definitive dentures and require to be relined as the tissues heal. These dentures can be considered for wear up to a year after tooth extractions (with relines as appropriate) after which times a more definitive solution should be sought. These dentures can be relined with a hard or a soft material, or indeed, lined with medication for instance after surgery in a particulr area. They are very useful and can be easily adjusted and manipulated if required to fit well with the change of healing areas in the mouth. Some denture set ups are used for diagnostic purposes, for instance, in full arch tooth replacement. These dentures can be used in function to determine that the final tooth position if acceptable both functionally and aesthetically and when this is achieved, a duplicate of the denture can be used both during a CT scan if appropriate and also during any surgery to place implants in order that the implants are placed in the correct position. There is a great variety of artificial teeth available for use in dentures. From standard to highly aesthetic teeth made from acrylic or porcelain. Teeth are set carefully to the desired set up by our technicians and can be highly aesthetic, or can incorporate slight abnormalities or anomalies that are seen in the dentition such as rotated or ‘squint tooth/teeth’ as the patient desires. In many cases, patients will bring photographs of how they looked with their natural teeth, allowing our technicians to replicate the set up. If required, fillings or crowns can be inserted into denture teeth to maintain the highly natural look. There are a great many shades available and these can be used to give the desired outcome, be it bright white teeth, or a single tooth specifically selected to merge with remaining natural teeth. As part of our standard denture procedure, impressions are taken from which special trays are constructed allowing very accurate and specific impressions to be recored. From there, the dimensions of the jaws are recorded, assessed and maintained or altered as required and various landmarks and specific points identified on the wax denture construction blocks. After tooth type selection and specific discussion with regards to set up, the technicians set up the teeth on the wax blocks for trial and approval by the patient. Depending upon the specific requirements, the trial stages can take a number of visits. Once approved, the dentures are finely waxed up to include facial support, contouring and gum stipling and staining all in order to maintain an highly natural appearance. The processed dentures are finished ready for delivery to the patient and are fitted and final checks made.